While it may seem like the Cold War 2.0 is happening, at least some US spies are getting the content Americans need. 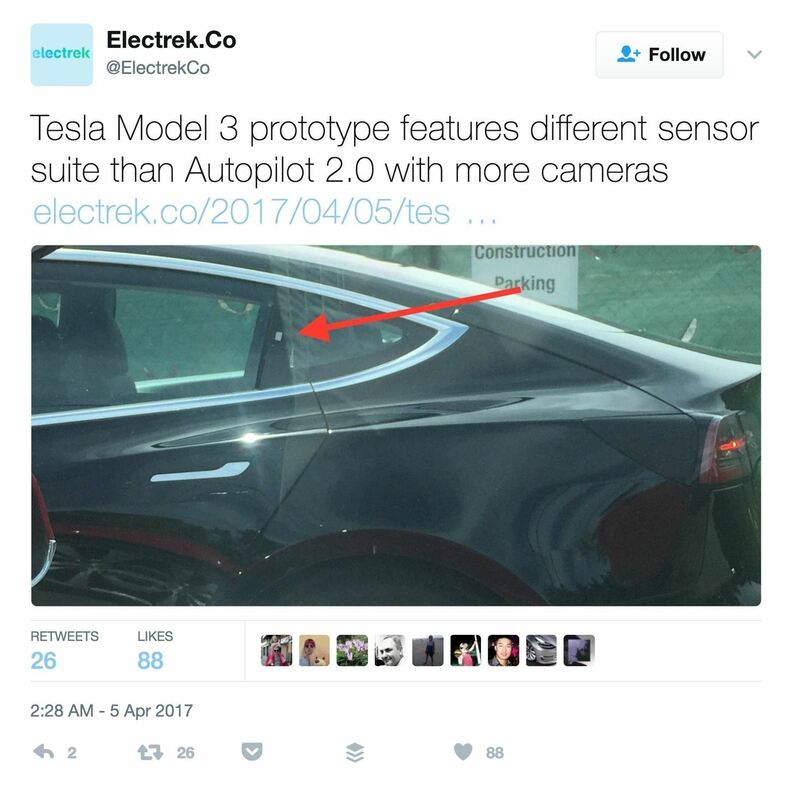 That's right, Electrek has gotten some new pictures of the Tesla Model 3.
as Electrek notes, features "8 cameras, 1 radar, and ultrasonic sensors all around. 3 of the cameras are front-facing, 2 are inside the B-pillars, 2 more are in the front fenders hidden inside the Tesla badges and the last one is rear-facing." This hardware is supposed to be what Tesla will eventually use to provide fully autonomous driving. It was to be included in all their new cars, including the Model 3. However, the new photos of the Model 3 feature a slightly different setup. In addition to the equipment previously listed, the photos, as seen from one side below, show two additional sensors on each of the C-pillars. Check out the full spread on Electrek.co. While this car may not be the final product, it does fall in line with Elon Musk's past statements about radar versus LiDAR, and support the idea that they're still staying away from this expensive laser technology. I don't think you need LIDAR. I think you can do this all with passive optical and then with maybe one forward RADAR… if you are driving fast into rain or snow or dust. I think that completely solves it without the use of LIDAR. I'm not a big fan of LIDAR, I don't think it makes sense in this context. We do use LIDAR for our dragon spacecraft when docking with the space station. And I think it makes sense in that case and we've put a lot of effort into developing that. So it's not that I don't like LIDAR in general, I just don't think it makes sense in a car context. I think it's unnecessary. Musk went on to say that Tesla uses radar sensors because "unlike LIDAR (which is visible wavelength), it can see through rain, snow, fog and dust." Musk has also downplayed the Model 3, claiming that it's simply a smaller and cheaper version of the Model S, with less power. That means the Model 3 may not be able to accelerate like the Model S, and its battery doesn't have as much range. Tesla may be downplaying the role of the all-new hardware architecture of the Model 3 in terms of improved occupant and pedestrian safety to avoid cannibalization of demand of the other models (i.e. S and X) that do not have the new hardware architecture. So, it's autopilot capabilities could likely go beyond its predecessor. It seems the only way we will get any concrete answers will be when Tesla releases the Model 3, which won't happen for a year. Until then, we'll be working with low-resolution pictures and fun speculation.